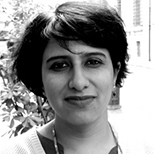 Anju Sharma is head of the Policy Analysis and Publications Unit of the European Capacity Building Initiative, a visiting fellow at the International Institute for Environment and Development, and a consultant for the International Institute of Sustainable Development’s Reporting Services. In addition to a number of papers and articles, she has co-authored Slow Murder: The deadly story of vehicular pollution in India, and co-edited two books on global environmental governance – Green Politics and Poles Apart. Her work is focused on seeking equitable solutions that balance environment and development concerns. OPINION: Forget Development Goals. Focus on Community Empowerment.